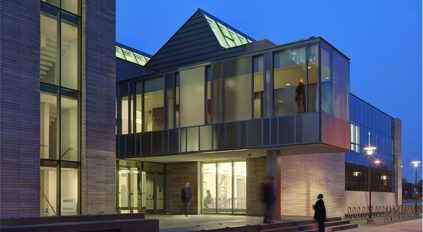 A three-day festival celebrating the opening of the Reva and David Logan Center for the Arts, a hub for the vibrant arts scene at the University of Chicago and a destination for the South Side and greater Chicago. Free and open to the public. Join us for the three-day arts festival! Works in various media by MFA students in the Department of Visual Arts will be on display in and around the Great Hall. Discover the Logan Center on your own with a printed guide that offers insight into several highlighted spaces within the building. Learn little-known facts about the architecture and design of the building while exploring the classroom, performance, and exhibition spaces at your own pace. 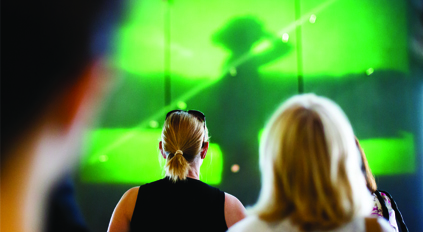 Experience the sounds of the Logan Center in a site specific installation designed by internationally renowned filmmaker, sound artist, composer, and provocateur Richard Lerman. As part of a series of multi-platform events, Lerman will install self-made transducers that relay acoustic vibrations to listening stations in the North tower stairwell. The sounds of persons moving through the Logan, along with sounds from the structure of the building itself, transform the space into an ever-changing, amplified sonic environment. A special outdoor performance by Bay Area-based Los Cenzontles, joined by Los Lobos singer-songwriter-front man David Hidalgo. Los Cenzontles (Nahuatl for “the mockingbirds”) effortlessly mix contemporary and traditional Mexican instruments to create a powerful sound infused with the gutsy soul of Mexico’s rural roots. WFMT celebrates the grand opening of the Logan Center with a live broadcast. Join Steve Robinson, David Schwan and Andrew Patner for live music, theater and conversation with luminaries from the arts community. Preview some of this year's offerings, learn more about the Logan Center and enjoy some great music as well. Hear a performance by the New Budapest Orpheum Society, an eight–member ensemble in residence in the Division of the Humanities at the University of Chicago. Performing Jewish Cabaret music and political songs from the turn of the 20th century to the present, the New Budapest Orpheum Society explores original materials in Hebrew, Yiddish, and German, as well as English. Gray Center Mellon Fellows Professor Patrick Jagoda and Visiting Professor Sha Xin Wei discuss their 2012-13 collaborative creation of an interactive production that belongs to the emerging artists form of “Alternate Reality Games” or “transmedia games.” Their yearlong project will culminate in a transmedia game experience in Spring 2013, together with a symposium about these emergent forms of collective event hybridizing play, game and performance. Song, poetry, recitation, calligraphy--these are some of the various ways by which Muslims practice and express the Islamic faith. In this performance, the UChicago MSA (Muslim Students Association) shares a similar expression of our faith culture by joining together to sing a nasheed/naat (in Arabic/Urdu respectively). This vocal composition, usually sung a capella, contains lyrics in reference to Islamic beliefs and/or history. See a special class demonstration and performance by Chicago’s Deeply Rooted Dance Theater. Rooted in traditions of African-American dance and storytelling, Deeply Rooted explores themes that spark a visceral experience and ignite an emotional response in diverse audiences world wide. Deeply Rooted is led by Artistic Director Kevin Iega Jeff and Associate Artistic Director Gary Abbott. UChicago Visual Arts professors Laura Letinsky and Geof Oppenheimer, along with students from the MFA class of 2013, discuss their recent trip to China that sought to investigate and develop cross-fertilization across geo-political and cultural arenas. Research focused on art galleries, monuments, artists’ studios, universities, and alternative art spaces. Creative Writing showcases its thesis students with a multi-genre reading of their work. Hear a performamce by the Ransom Notes, a student run, co-ed a cappella group at the University of Chicago. 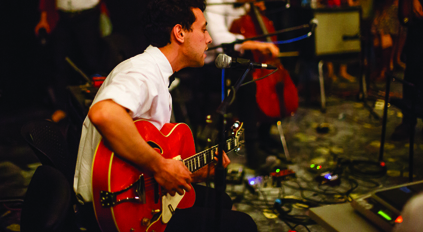 The Ransom Notes perform frequently on campus, at local venues, and other colleges. Patric McCoy, president of Diasporal Rhythms, a group of collectors of contemporary works by artists of African descent, engages in a conversation with Monika Szewczyk, Visual Arts Program Curator at the Reva and David Logan Center for the Arts, in anticipation of the Diasporal Rhythms 10th Anniversary Exhibition, scheduled at Logan Center Gallery for Fall 2013, and a day ahead of the group's 7th annual Collectors Home Tour, taking place on 13-14 October throughout the South Side. UChicago alum David Auburn (AB’91) returns to campus to discuss his work on the award-winning play “Proof” and current projects with Charles Newell, Artistic Director of Court Theatre. 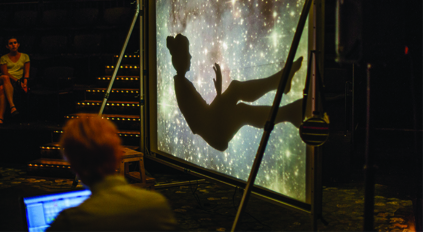 Auburn’s visit coincides with three student performances of “Proof” taking place throughout the weekend. Buy Tickets. What is the role of place in artistic practice? Join artist and Associate Professor in the Department of Visual Arts, Pope.L as he shares his latest project and reflects on the importance of place in shaping his work—both as it relates to his recent move to the University of Chicago and his commission to create work for New Zealand. The University Jazz X-tet explores the music of two jazz legends, Thelonius Sphere Monk and Chares Mingus, in this innovative, finger-snapping and collectively improvised performance. Acclaimed New York architects Tod Williams and Billie Tsien discuss the design of the Reva and David Logan Center for the Arts—their first Chicago commission—and how creating creative spaces has influenced their work. Guided architectural tours of the building will be offered prior to the conversation. See a performance by University Ballet of Chicago. Founded in 2001, the University Ballet of Chicago provides classical ballet instruction and performance opportunities at the University of Chicago. Since its founding, the company has produced more than a dozen classical and contemporary productions, showcasing the talents of undergraduates, graduate students, post-doctoral fellows, university employees, and Chicago community members. Hear a poetry reading with Tom Raworth. Born in London in 1938, Raworth has taught; printed and published poetry by others in both magazines and books; had more than 40 books of his own (poetry and prose) published; been translated into many languages; exhibited his graphic work worldwide; collaborated with musicians, visual artists and other writers; and has given readings in more than twenty countries (most recently China and Mexico). Carcanet published his Collected Poems in 2003, and plan a Selected Poems for his 75th birthday next year. First of the weekend’s student performances of the Tony© Award-winning play “Proof” – Written by alumnus David Auburn, “Proof” tells the story of Robert, a genius mathematician who suffered from mental illness. After Robert’s death, his daughter Catherine tries to come to grips with her possible inheritance—his insanity—and finds matters complicated by one of her father's ex-students and her estranged sister. “Proof” is directed by Block Box Studio’s Audrey Francis and features Chicago actor Steve Pickering. Buy Tickets. Sonic Environments, a series of multi-platform events by internationally renowned filmmaker, sound artist, composer and provocateur Richard Lerman, launches with this selection of films, video pieces and live performance. Among the works to be showcased at this unique event are Lerman’s famous “Sections for Screen, Performers and Audience” (1974) and his innovative “piezo disk,” which transform everyday objects (passports, thorny branches, a compass) into instruments for a look at Border issues in 2012. Lerman will be on hand for this multi-media presentation. These sessions invite the public to explore and debate current issues and interesting topics in science research at the University, for the price of a cup of coffee or a glass of wine. Part of a loose knit program which take places on campuses around the world, the next generation of scientists offer up an informal and accessible conversation about their research, and lively questions and comments from the audience are expected. Visiting Mellon Fellow in Arts Practice & Scholarship Sha Xin Wei and Michael Montanaro (of Montreal's Topological Media Lab) join forces with U of C Professor Patrick Jagoda to launch a year-long collaboration at the Gray Center for Arts & Inquiry with a choreographed action-based event introducing The Project, an alternate reality transmedia game. 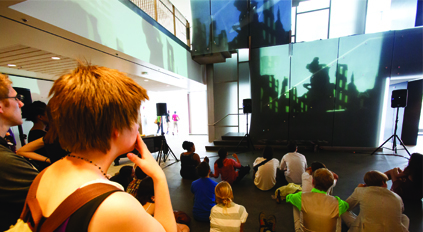 Game development by students, faculty, and artists begins this fall and culminates in exciting and unpredictable constellations of play, practice & theory in spring 2013. 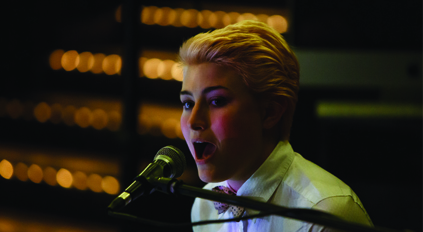 The Logan Cabaret series offers a weekly platform for individual artists and groups to take the stage during an informal night of live performance. Featuring a student MC, the student driven evening will offer a mix of comedy, spoken word, rock music, solo dance performance, poetry readings, improvisational jazz, works-in-progress, short play readings, and more. Are you a student interested in performing? Email logancenter@uchicago.edu for more information. Explore the possibilities of when and how we share stories in this workshop for all ages. Learn creative approaches to oral storytelling, both creating and telling stories, in small family groups. The workshop is led by Emily Hooper Lansana, who has performed and taught storytelling in a variety of venues throughout Chicago and across the country for more than 20 years. Have you ever wanted to bring your toys to life? This fun workshop with LEGO animator David M. Pickett, AB’07, will give you hands-on experience with the basics of stop-motion animation and teach you what you need to start making movies at home. Bring a toy to animate or use the ones provided. 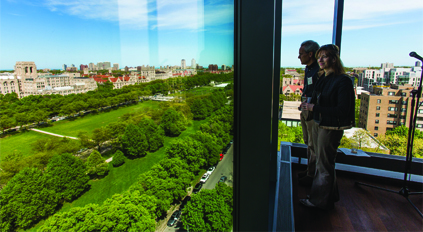 Organized by the Chicago Architecture Foundation, Open House Chicago (OHC) is an annual weekend festival providing free behind-the-scenes access to many of Chicago's greatest places and spaces. 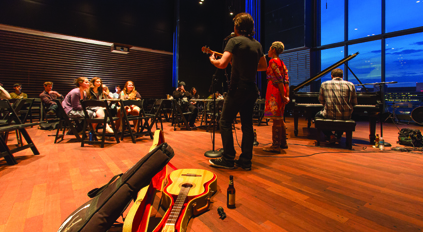 The Logan Center, selected as one of OHC’s “Top Twenty Sites to Visit,” will offer self-guided tours for OHC participants that feature “backstage” areas of the performance spaces as well as private studios. View a short film made by students participating in an eight-week summer film class at the Logan Center for the Arts, Think it! Make It! Screen It! The course is taught by Catherine Sullivan, artist and Assistant Professor of Visual Arts at the University of Chicago in collaboration with local not-for-profit Faithful Few and the Arts and Public Life Initiative. Kicking off a new free monthly family programming series at the Logan Center, Chicago’s Barrel of Monkeys (BOM) will perform its classic, “That’s Weird, Grandma,” which showcases the amazing talents of student authors and their company of performers. BOM is an ensemble of actor/educators who create an alternative learning environment in which children share their personal voices and celebrate the power of their imaginations. The show changes each time it’s performed as audience votes pick new stories to add. Explore The Reva and David Logan Center for the Arts on a tour with a knowledgeable guide. Hear about the building’s history, architecture, and role within the University with visits to the performance hall, blackbox theatre, digital media center, classrooms, gallery and more. Sign up for tours at the North Entrance Welcome Desk. Spaces are limited, and will be filled on a first-come, first-served basis. 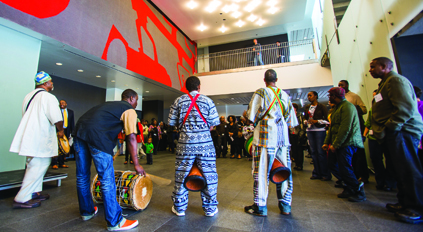 Join local community artists and leaders as we celebrate the Opening of the Reva and David Logan Center for the Arts during the Logan Launch Festival Lunch on Saturday, October 13 from Noon to 1:30 pm. This festive BBQ will include performances by the Muntu Dance Theatre Drummers and the New Beginnings Church Choir and serve as on opportunity to thank you, our friendsand neighbors for your great support during our Preview Period includin 20th Ward Alderman Willie B. Cochran and other area political officials, community stakeholders, and residents. With “All Our Tragic,” popular Chicago director Sean Graney has adapted all 32 surviving Greek tragedies of Aeschylus, Sophocles, and Euripides to create an epic 12-hour cycle-play theater event, in two parts: Politics and Ethics. “All Our Tragic” will have its UChicago premiere at the Logan Launch Festival, by both professional and student actors. This presentation is modeled after the Ancient Greeks’ communal festivals or gatherings, which encompassed music, theater, politics and eating. 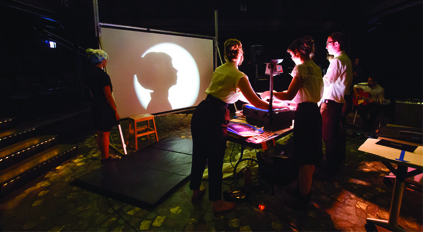 Bicycles become the instruments in Richard Lerman's Travelon Gamelon - a collaborative, community-based, live performance work. Beginning with a roving, sonic “promenade”, 20 cyclists on Lerman’s amplified bicycles travel the neighborhood broadcasting the sound of each cycle's spokes, producing a sound similar to that of SE Asian Gamelan orchestras. The performance departs from the Logan Center and travels through the campus and Hyde Park neighborhood before returning to the Courtyard Stage for the performance of the Concert version for 3 amplified bicycles and 6 performers. Travelon Gamelon, composed in 1979, has been performed hundreds of times around the world most recently in 4 cities in Germany and in Chicago in 1980 and 1989. 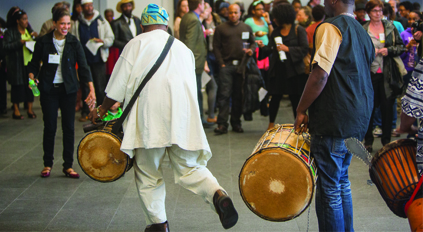 Join Artistic Director, Amaniyea Payne, of Muntu Dance Theatre for an African dance workshop. The Chicago-based Muntu Dance Theatre performs authentic and progressive interpretations of contemporary and ancient African and African-American dance, music, and folklore. Join ArtShould for a fun family craft! Construct and decorate a paper lantern that you can bring home today! ArtShould is a student group that works to provide fun after-school arts programming at CPS elementary schools in Hyde Park, Kenwood, and Woodlawn. Celebrated recording artist and UChicago director of vocal studies Patrice Michaels presents a stunning concert of songs for voice and piano. Familiar and newly-composed blues, ragtime, ballads and art songs by Tibor Harsanyi, Laurie Altman, Chuck Israels, John Musto and others reveal a glorious musical conversation in a unique genre linking jazz and classical music. As part of Chicago Ideas Week, University Architect Steve Wiesenthal and Kirkegaard Associates’ acoustician Anthony Shou leads a behind-the-scenes Logan Center tour revealing how intense collaboration can successfully balance architectural and acoustical expressions while creating spectacular music performance spaces. Buy tickets ($15). Join University of Chicago students from Fire Escape Films as they screen some of their latest work and highlight student film making at the University of Chicago. Listen to student musicians from the Hyde Park Suzuki Institute! The Hyde Park Suzuki Institute seeks to provide access to high quality musical instruction and performance opportunities to families in our culturally diverse communities of Chicago. Students ages three and up proudly maintain a commitment to excellence and a high standard of musical achievement. These performances at the Logan Center provide opportunities for students to engage with Chicago's rich cultural offerings, attend professional concerts, and meet world-renowned musicians. Mehndi (henna) is the application of a plant and turmeric paste, in the form of a design or decoration, to the skin like a temporary tattoo. It originates from India, Pakistan, Nepal, and Bangladesh, as a traditional custom, most often applied on women at special occasions like weddings (ex. on the brides' hands and feet) and religious festivals. The UChicago MSA brings you a workshop on how to make basic mehndi designs and, if you would like, will adorn your hand with a beautiful decoration. Sean Hogan (3rd year, College), discusses the development of his and Jon Kittaka's (Carleton College) soon-to-be-released adventure game, Anodyne. The discussion encompasses game design, development workflow, and aesthetic choices (art, music) in Anodyne, including live gameplay and a Q&A. Learn how to practice, present and evaluate a world premiere music composition in this interactive performance and discussion moderated by University Professor Augusta Read Thomas, featuring pianist Daniel Schlosberg, UC graduate student composer, Andres Carrizo, and a panel of active UC composers. Stop by the ArtShould table to tell us what you think ArtShould do! Fill out and decorate a piece of paper for us to display at the Logan Center Launch. Your ideas can be silly or serious, insightful or nonsense. ArtShould is a student group that works to provide fun after-school arts programming at CPS elementary schools in Hyde Park, Kenwood, and Woodlawn. Ligeia Quartet, a semi-professional performance group involved with the University of Chicago Chamber Music Program, performs movements 1 (Allegro) and 2 (Andante con moto) of Franz Schubert's Death and the Maiden quartet (String Quartet No. 14 in D minor). Learn about the Sitar and South Asian classical music in this interactive workshop and performance. Audience members can sing a song of their choice and will be accompanied by the sitar. The sitar can used to play any kind of music; it all depends on what's playing in your head! Join the UofC Argentine Tango Club for an introduction to the most elegant and expressive dance of all: Argentine Tango. No partner or dance experience is required. Please find more information about the club and classes on tango.uchicago.edu. Adam Zagajewski, one of Poland’s most famous contemporary poets and the Ferdinand Schevill Distinguished Service Professor at UChicago’s John U. Nef Committee on Social Thought, will launch this series with a reading of his own world premiere work, “We Know What Art Is” commissioned by the University and the Reva and David Logan Foundation for the Logan Center Dedication and Logan Launch Festival. A graduate of Jagiellonian University in Kracow, Zagajewski first became well known as one of the leading poets of the Generation of ‘68’ or the Polish New Wave. Watch expressive and elegant moves, hear melancholic and energetic music or participate in “Guerrilla Tango dancing” hosted by the UofC Argentine Tango Club. Learn more about exceptional outdoor and social dancing events as well as regular courses on tango.uchicago.edu. 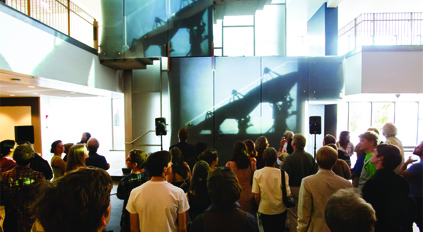 “Opening,” a recent video collage by graduate students Jared Clemens and Marco G. Ferrari, will be projected on to the facade of the Logan Center. An audiovisual montage that manipulates original and archival materials relating to various brain processes, “Opening” is comprised of formal manipulations of color, speed, rhythm, and sound, to reflect the spatiotemporal concept of neural activity and highlight the complexity of the brain. Occam's Razor is the University of Chicago's only independent improv group, dedicated to bringing you the finest and funniest in all-improvised comedy. Mwata Bowden, acclaimed jazz musician and Director of the UChicago Jazz Ensembles, will be joined by University Jazz X-tet alums to celebrate the group's 18th anniversary. "Beyond 5 Lines and 4 Spaces" will debut new music inspired by gardens in Paris, Japan, and Vancouver, and composed by Bowden and X-tet alums. 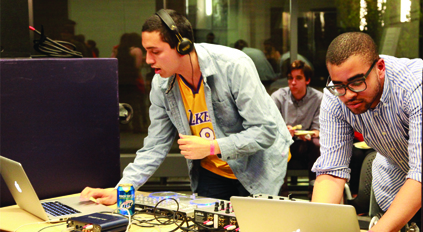 The intricate, maze-like program will showcase music on the cutting edge! Director of Choral Activities James Kallembach leads a presentation and discussion with current students and alumni on the vibrant state of the current choral and vocal program at the University of Chicago. Rockefeller Chapel Artist-in-Residence Matthew Dean (AB ’00) and members of the Motet Choir will perform; selections may include recently campus-commissioned or premiered works, including those by composer Kallembach. The Chicago Association of Black Storytellers presents the work of the Ase` Youth Ensemble, which celebrates the importance of the oral tradition through storytelling and poetry. See engaging performance of folktales, poetry and stories performed by young people between the ages of 6 and 17. Hear a special performance by Miguel de la Cerna (piano), Ari Brown (saxes), Harrison Bankhead (bass), and Ernie Adams (drums), presented by the Hyde Park Jazz Society. Founded by James W. Wagner, the Hyde Park Jazz Society is committed to the encouragement, promotion, and expansion of jazz performance in the greater Hyde Park community and mid-south side, as well as to the education of young jazz musicians and expansion of the jazz listening audience. Celebrate the Logan Launch with a party at the Logan Center! Explore the new space and mingle with other students while enjoying live entertainment by alumni band Lakesigns and performances by student RSOs. Food and drink provided, alcohol available on the Delgiorno Terrace for those 21+. Additional events will be announced soon! Sign up for e-updates above for the latest festival details. Download the Logan Launch Festival program and plan your weekend! Sign up for e-updates above for festival details and the latest events added. Public opening celebration October 12–14. The Logan Center has north and south entrances. The north entrance is on E. 60th Street. The south entrance can be accessed by a circular drive on S. Drexel Avenue.